Haq's Musings: Will "Final Chance" Talks with Pakistani Taliban Succeed? Will "Final Chance" Talks with Pakistani Taliban Succeed? So why did Prime Minister Nawaz Sharif decide to make the "final chance" offer of talks to the TTP just when it seemed his government was ready to launch a military operation to root out the Pakistani Taliban? Let's explore the answer this question in some detail. While the number of Pakistanis who support the Taliban is very small and shrinking, there are still significant numbers of people who are opposed to using military force against them. The most recent poll data on this issue is from a Pew Poll conducted in May 2013. It showed that only 17% of respondents said they have a favorable view of the TTP while 56% have an unfavorable view of them. 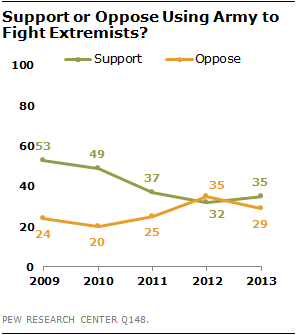 However, only 35% of the people support the use of military force against them while 29% oppose it. There is a very slim chance of success of Pakistan's talks with the TTP. Why? Because there have been several failed attempts earlier to bring peace through talks with the them. First such agreements was concluded between Nek Mohammad and Pakistani military in Shakai Valley in 2004. Both sides agreed to peace with the understanding that the Taliban will not host foreign fighters and they will not attack Pakistani military or civilians. In return, the government offered compensation to the families of those killed, pay off TTP's debts to Al Qaeda and release Taliban prisoners. While the government held to its part of the bargain, the Taliban did not. The deal broke down almost immediately; Mohammed claimed he never agreed to identify or hand over any Al Qaeda militants and the Taliban began killing tribal elders who helped broker the agreement. Shakai Valley deal was followed by peace agreements at Sararogha in 2005 and then Swat in 2009. Both of these deals also failed because of the Taliban non-compliance. The TTP intensified violence against civilians after each of these details. Both the Pakistani Taliban and the government see talks as an opportunity to gain support of the fence-sitters, those who dislike the Taliban but are unwilling to support military action against them. The Taliban will try and show their willingness to talk to get "Shariah" implemented "peacefully" in Pakistan. Their aim will be to strengthen the resolve of those who support them to bring "Shariah" while swaying the fence-sitter to join their side. 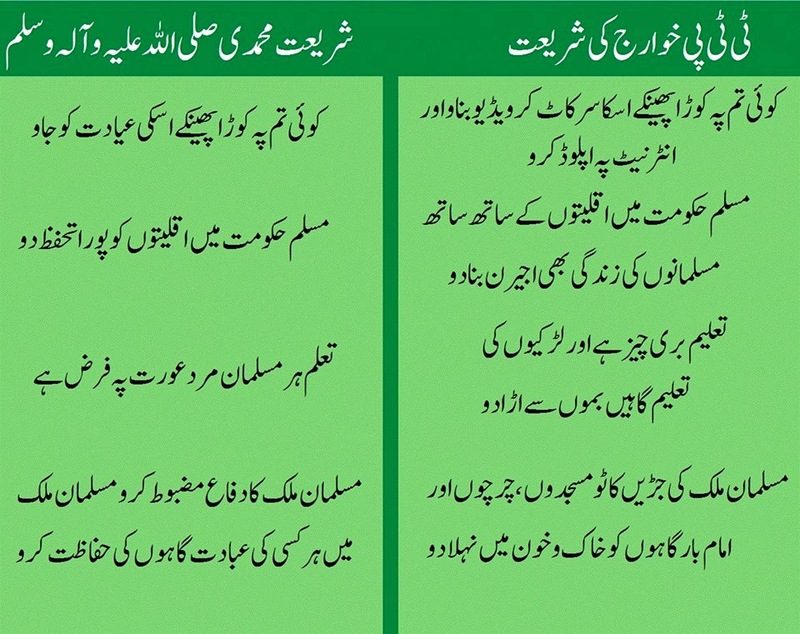 Taliban "Shariah" is fake. Say No to Taliban "Shariah"
Pakistani government needs to demonstrate to the fence-sitters that it, too, wants to give peace a chance before resorting to military force as a last resort. The government must also persuade people that the Taliban "Shariah" has nothing to do with the real Shariah of Prophet Muhammad (SAW) who came as a blessing for the entire world (Rematul lil Alameen). Far from being a blessing to the world, the Taliban are a curse on humanity. They are simply using the talk of "Shariah" as a Trojan horse to win power for themselves. Pakistani leaders need to remind the people of what the Taliban did in Swat in 2009 after agreeing to peace in the name of "Nizam-e-Adl" when they tortured and killed large numbers innocent civilians and bombed girls' schools. The people need to be repeatedly shown the death and destruction of tens of thousands of lives wrought by the Taliban in all parts of the country over the last decade. If history is any guide, the chances of success of the current peace talks between Pakistan government and the Taliban are slim to none. While it would be great to be proved wrong, I think it's time for Pakistani government and the people to prepare for a long, sustained campaign to rid the country of the TTP terrorists. If Pakistan fails to defeat the Taliban, they will destroy Pakistan. Can Pakistan-Taliban Talks Succeed Will India-born Nadella Turn Microsoft Around? from WBT TV on Vimeo. Thank you very much for a comprehensive & realistic assessment of the situation supported by poll data and "almost" public opinion that Taliban Sharia is fake. Nawaz Shareef's stance with the situation is impressive. I hope he is able to carry it ou and rid the nation of lingering insurgency. Athar: "Thank you very much for a comprehensive & realistic assessment of the situation supported by poll data and "almost" public opinion that Taliban Sharia is fake. Nawaz Shareef's stance with the situation is impressive. I hope he is able to carry it ou and rid the nation of lingering insurgency." I too share your hope. Shams: "100% of Shias wouild want to see Taliban obliterated forever. Shias are nearly 20% of the Pakistan population. Obviously data sampling errors"
I bet the 35% who support military action against TTP include the 20% shia population. That's why % of those who support mil op has never fallen below 20%. Sounds like you think all Shiites are anti-Taliban? ...Karachi is likely to pay a steeper price if efforts by Prime Minister Nawaz Sharif's government to forge a peace deal with the al Qaeda affiliate's leadership in tribal areas collapse and a military operation is launched there. "If the peace talks fail, we fear that a big terrorism wave will hit Karachi," said Raja Umar Khattab, a senior officer in the counterterrorism Crime Investigation Department of the Karachi police. The Pakistani Taliban are a national threat, with Karachi providing the group a vital financial lifeline. Money raised in Karachi from extortion, land-grabbing, kidnapping and robberies is sent to the group's leadership in the tribal areas along the Afghan border, security officials said. In January, the militant group attacked police officers, shot and killed three journalists, repeatedly bombed paramilitary Rangers who are helping carry out the crackdown, gunned down three polio-vaccination workers, and slit the throats of six devotees visiting a shrine. Karachi police said 27 officers were killed in January, after 168 were killed last year. Last year, five different police chiefs served Karachi, disrupting the battle against crime. The current chief, Shahid Hayat, said that at any given time, he had about 7,000 officers available to be deployed on the streets, out of a total force strength of 27,000—9,000 officers are kept on personal security duty for politicians and other officials. It is only in recent weeks, he added, that the operation has shifted focus to jihadi groups such as TTP. "I'm being asked to control Karachi with such small numbers of police," said Mr. Hayat. "Policemen are being killed day in, day out. But we're still fighting." More than 13,000 people have been arrested in the sweep since September, in more than 10,000 raids by police and the paramilitary Rangers force, the provincial Sindh government said. But officials and residents said it has left largely untouched the poor outlying neighborhoods that remain under TTP control, encircling the city, including one adjacent to the new U.S. Consulate compound. In the areas it controls, TTP is levying a tax on residents and businesses, said a businessman in Sohrab Goth, a Taliban-run neighborhood just north of the city center. The militant group has set up courts in neighborhoods to resolve disputes, which give written judgments, handling matters that include disagreements over land ownership and regulating levels of theft from power lines that they allow, residents said. "The Taliban milk money from their own communities," the businessman said. "They have calculated the worth of every person here." For instance, on a monthly income of 40,000 rupees ($380), TTP takes a levy of 1,000 rupees. Concentrate blocks made for use in construction—a major business in the Pashtun areas—are sold for 18 rupees each, of which three rupees goes to the Taliban. The businessman said TTP's hold had hardened over the past year. Planning for the operation comes amid a Pakistan-requested pause in U.S. drone strikes now entering its third month — the longest period without an attack in more than two years — and a series of high-level U.S.-Pakistan meetings. Pakistan’s defense secretary, Asif Yasin Malik, is currently heading a delegation of security officials in Washington. CIA Director John Brennan quietly visited Pakistan last week, days after Gen. Lloyd J. Austin III, head of the U.S. Central Command, held meetings at military headquarters in Rawalpindi. No Pakistani civilians were killed by US drones last year as Washington slashed its controversial use of the pilotless planes in the country, a UN expert said Wednesday. "I am pleased to be able to report a very significant de-escalation in the use of armed drones by the United States in... Pakistan," Ben Emmerson told reporters in Geneva. The total number of recorded strikes in 2013 was down to 27 from a peak of 128 in 2010, said Emmerson, who monitors respect for human rights in counter-terrorism operations. "But perhaps most significantly, for the first time in nine years there were no reports of civilian casualties during 2013 in the FATA area of Pakistan," he added. The FATA, or Federally Administered Tribal Areas, is a region bordering Afghanistan where Pakistan's military is battling the Taliban and the United States has used drones to strike at Al-Qaeda militants. Drones, which beam footage to operators at distant US bases who then launch the strikes, are meant to allow precision hits. But they have caused uproar in Pakistan over civilian casualties in botched strikes, as well as concerns that their use has hampered efforts to hold peace talks with the Taliban and breached national sovereignty. Last May, US President Barack Obama raised the bar for launching attacks. But despite the change of tack in Pakistan, Emmerson said that the picture in Afghanistan and Yemen was "much bleaker". Citing a report by the UN Mission in Afghanistan, he said that there was a threefold increase in drone-related civilian casualties between 2012 and 2013. A total of 45 Afghan civilians died in drone strikes last year, he said. "And the picture in Yemen remains cause for serious concern. The frequency of armed drone strikes appears to have intensified, particularly during the closing months of 2013, with a sharp escalation in the number of reported civilian casualties," Emmerson said. At least 12 people are believed to have died when a drone struck a wedding convoy in Yemen in December. Emmerson spoke to reporters after addressing the UN Human Rights Council, where he presented research on dozens of drone strikes where civilians allegedly perished, pulled together by his team on a special website www.unsrct-drones.com which helps reconstruct attacks. Few Pakistanis get to visit Colombia, a country quite physically and culturally distant from their land of abode. Yet as I discovered from my visit to Colombia’s capital Bogota this week, there is much which Pakistanis can learn from this land of coffee, cocaine and coal. So what are the similarities between these two ostensibly disparate lands, separated by geography, ethnicity and religion? A troubling common thread between Colombia and Pakistan pertains to the issue of terrorism and guerrilla insurgency. For the past few decades, both countries have been fighting locally grown, ideologically driven, terrorist militias, which receive some degree of foreign support but also thrive on drug money and various forms of extortion and kidnapping. Both countries are also currently involved in controversial peace processes with the insurgents that remain far from achieving their aim but are likely to continue. Colombia’s experience with fractured politics and terrorism predates Pakistan’s predicament. The country achieved independence from colonial Spain in 1819 — long before Pakistan was even dreamed of. Yet soon thereafter, the unified territory of “Gran Colombia’ fell apart, and Venezuela and Ecuador seceded from the land as independent states in 1830 – the same year that the great revolutionary and colonial liberator Simon Bolivar died in the northern Colombian city of Santa Marta. Like Colombia, Pakistan also has experience with secession – Bangladesh’s independence in 1973, only 26 years after independence from Britain. Pakistan has to also learn from the Colombian experience that negotiations are only workable with such groups if there is some unified negotiation hierarchy and influence across the guerrilla population who are involved in terrorist activity. Unlike the FARC, the Taliban have so many factions that negotiations over specific actions become hard to enforce. Once there is some clarity on the enforcement power of the negotiators, it is worth considering whether the terms of a peace plan might undermine the overall functionality of the Pakistani state. For example, any points of negotiations regarding marginalization of minority sects such as Shias who constitute 20% of the population would lead to ruin. The FARC are willing to join the political process within Colombia if their basic demands for land and resource management regimes are met. Would the Taliban be willing to do so if given limited degree of governance in particular parts of the country so as to prevent imposition of their worldview in some form over all of Pakistan? How might there be enforcement of their sphere of influence under a peace plan? Expansionary tendencies will need to be monitored carefully in both peace processes. Disparate as they may seem on the surface, Colombia and Pakistan have much to gain from exchanging notes with each other on dealing with their intractable insurgencies. In a globalized world where arms and drugs can flow freely across the miles, surely lessons on governance and peace-building should find no barriers. A good analogy here is the founding ideals of our ..
Boko Haram, the cultlike Nigerian group that carried out the kidnappings, was rejected long ago by mainstream Muslim scholars and Islamist parties around the world for its seemingly senseless cruelty and capricious violence against civilians. But this week its stunning abduction appeared too much even for fellow militants normally eager to condone terrorist acts against the West and its allies....The dismay of fellow jihadists at the innocent targets of Boko Haram’s violence is a reflection of the increasingly far-flung and ideologically disparate networks of Islamist militancy, which now include the remnants of Bin Laden’s puritanical camps, Algerian cigarette smugglers and a brutal Somalian offshoot. In 2005, Binyavanga Wainaina published a brilliantly sarcastic essay in Granta called “How to Write About Africa,” advising people on how to sound spiritual and compassionate while writing a book about the continent. There’s been something similarly distorted to some of the social media reactions to the Boko Haram atrocities over the past week. It’s great that the kidnappings and the massacres are finally arousing the world’s indignation. But sometimes the implication of the conversation has been this: Africa is this dark and lawless place where monstrous things are bound to happen. Those poor people need our help. But this is more or less the opposite of the truth. Boko Haram is not the main story in Africa or even in Nigeria. It is a small rear-guard reaction to the main story. The main story in Africa is an impressive surge of growth, urbanization and modernization, which has sparked panic in a few people who don’t like these things. Many countries in sub-Saharan Africa are growing at a phenomenal clip. Nigeria’s economy grew by 6.7 percent in 2012. Mozambique’s grew by 7.4 percent, Ghana’s by 7.9 percent. Economic growth in sub-Saharan Africa as a whole is predicted to reach 5.2 percent this year. Investment funds are starting up by the dozen, finding local entrepreneurs. The first is the clash over pluralism. Africa has seen an explosion of cellphone usage. It’s seen a rapid expansion of urbanization. In 1980, only 28 percent of Africans lived in cities, but today 40 percent do. This has led to a greater mixing of tribal groupings, religions and a loosening of lifestyle options. The draconian anti-gay laws in Nigeria, Uganda, Burundi and many other countries are one reaction against this cosmopolitan trend. The second is a clash over human development. Over the past decade, secondary school enrollment in Africa has increased by 50 percent. This contributes to an increasing value on intellectual openness, as people seek liberty to furnish their own minds. The Boko Haram terrorists are massacring and kidnapping people — mostly girls — at schools to try to force people to submit to a fantasy version of the past. The third is the clash over governance. Roughly 80 percent of Africa’s workers labor in the informal sector. That’s because the formal governmental and regulatory structures are biased toward the connected and the rich, not based on impersonal rule of law. Many Africans are trying to replace old practices with competent governance. They are creating new ways to navigate between the formal and informal sectors. Too many of our images of Africa are derived from nature documentaries, fund-raising appeals and mission trips. In reality, Africa faces in acute forms the same problems that afflict pretty much every region these days. Most important: Individual and social creativity is zooming ahead. Governing institutions are failing to perform the basic, elementary tasks. The head of the Pakistani Taliban is making a last-ditch bid to stamp his authority on the increasingly divided insurgency by ordering a top commander sacked, Taliban sources said Saturday. Taliban head Maulana Fazlullah moved against Khan "Sajna" Said on Friday after weeks of bloody infighting in the powerful Mehsud tribe that supplies the bulk of the Pakistani Taliban fighters, they said. Scores of men have been killed. The risk for Fazlullah is that Said might ignore him and battle on. Said is trying to wrest control of the Mehsud tribe - with its many weapons and lucrative smuggling routes and extortion business - from rival Shehryar Mehsud. The factional fighting has complicated attempts by the Pakistani government to end the insurgency through peace talks it proposed in February. Some commanders are in favor of talks but others vowed to continue their insurgency. "It's a test case for Maulana Fazlullah and his shura," a Taliban commander said, referring to the movement's leadership council. "It will determine their future." "If Sajna is convinced and he stops fighting, it conveys a good message to rest of the Taliban factions," he said. "Otherwise it will be a setback for Fazlullah if Sajna refuses to obey his command." Fazlullah has repeatedly appealed in vain to the two Mehsud rivals to stop fighting. An earlier peace deal brokered by the powerful Haqqani network of fighters fell through, undercutting the militants' ability to mount attacks against security forces. Notorious for ordering the attempted killing of schoolgirl activist Malala Yousafzai, Fazlullah is the first non-Mehsud leader of the Pakistani Taliban and has struggled to impose his authority on the powerful tribe. He faced many challengers to become chief of the Pakistani Taliban last year after the death of the previous head in a drone strike. He has been hiding in Afghanistan since then. But the time has come to exert his authority, a senior member of the Taliban said. "Senior members of Tehrik-e-Taliban Pakistan had tired of appealing (to the two rivals) to stop their clashes," he said. The Taliban sources said Fazlullah turned to an influential hardline commander, Khalid Omar Khorasani, to appoint a new commander in place of Said, who wants to join the peace talks. Khorasani, who opposes the talks, ordered the decapitation of 23 hostages from a government paramilitary force shortly after Islamabad announced its peace initiative. Taliban commanders said Khorasani had been chosen to appoint a successor not just because of his hardline reputation, but because of his ability to unite various factions. "All militant leaders respect him for his sacrifices in organizing all the militant factions and that's why Fazlullah gave him this difficult task," a Taliban commander said.